This special 'V'skew chisel, supplied by Packard Woodworks, is designed to professional woodturner, Keith Tompkins' personal specifications. Typically, the skew is a tool that strikes terror into the heart of many woodturners around the world, but perhaps this is about to change? Even with the patient instructions of professional turners, Richard Findley and Dave Regester, it proved difficult for me to gain any pleasure from the skew chisel, until I tried this one from Packard Woodworks. The tool supplied to me was almost ready to be used from the packet, but I took the trouble to hone the cutting edges first. 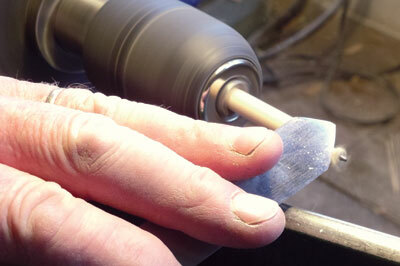 Sharpening is not too difficult but the convex bevel must be considered, as retaining the angles is important. Using the tool for the very first time was a revelation in itself - amazed is an understatement. To make my testing that much more difficult I used some resinous 50mm (2in) square pine (Pinus spp) and started by turning a pommel. I had never made one before but it was easier than I had ever imagined. I then turned down the rest to a cylinder, which again proved to be almost too easy. Cutting up to the pommel was simplicity itself due to the curved nature of the cutting edge. Twisting and swinging the tool ensured that the cutting edge remained in contact, as did the bevel, and the cutting tip went right into the corner with no catches. Cutting across end grain and rolling beads proved traumatic but it is obviously only down to practice. The semblance of a bead was produced as was a design feature in the shape of a spiral along the turning, so the catch claims are not wholly true. I did try to get a catch and I did succeed, but it was far more difficult than if I had been using a normal skew - curved or otherwise. The finish from the tool was outstanding; in the hand of an expert the normally sharpened skew chisel can produce a silk-like finish which, as a raw beginner, I could replicate with the Tompkins V-skew chisel. Having plundered for a long time with a standard skew chisel the Tompkins V-skew is a tool that is very likely to be used often. 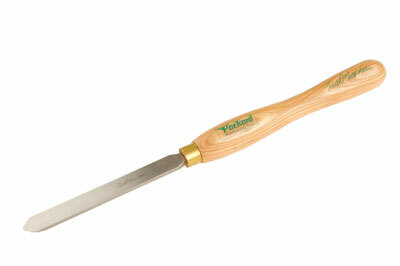 This skew chisel is extremely useful to the beginner as a possible step towards using conventional skews. It is also one that stands on its own merits, despite or because of, having a long curved bevel which means that it can be used for quick, easy roughing down in both directions. I also found that it is much easier to get the correct angle for planing cuts with this tool. You do need concentration and practice in order to get the best out of the edges but it is much more forgiving than a conventional straight or curved skew.